I'm back today with my favorite dress pattern to sew for summer. And modeling it is my adorable niece. 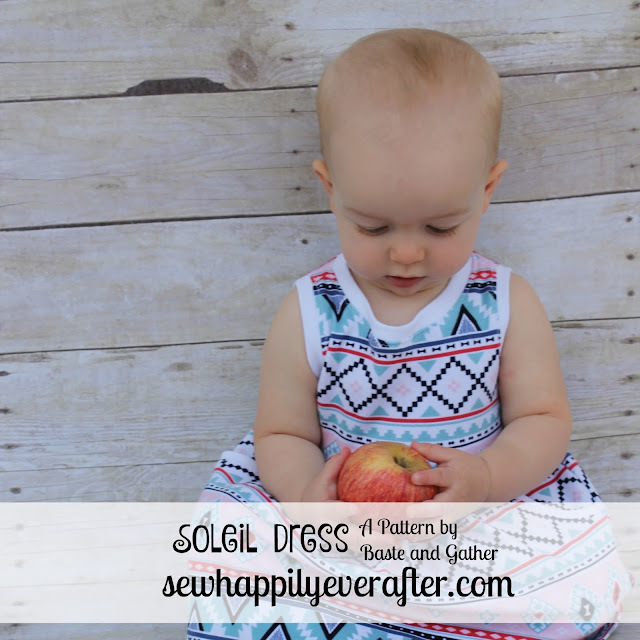 Her measurements were just under the recommended measurements for the Soleil Dress pattern for size 12 months, but since that was the smallest size available in the pattern, I went ahead and made it for her. So she has a little bit of room to grow into it, and maybe it will fit her next summer as a little tunic. My very favorite detail in this dress is the back opening. I love that little surprise. An option for a closed back is also included in the pattern if you wish for that instead. My second favorite detail in this dress is the pockets. They are so adorable in size 12 months, but you can see in my previous post that they are just as fun in the larger sizes. I also really love how the gathers in the front of the dress are all bunched together at the center. This helps the pockets to be shaped well. In fact this pattern is the first one that I have ever made and bound pockets in this way, so it took me a minute to wrap my mind around the construction. If you have never sewn with knit, this would be a great dress to try it out on--especially if you choose the solid back option. Normally I like to sew knits with my serger, but lately I've been finding that I really love my standard sewing machine for knits by using the knit stitch. If you don't have a special knit stitch, just use a short zig zag stitch. I love patterns by Lauren at Baste and Gather. You can purchase all of her patterns at (affiliate link) UpCraft Club. If you are a member, you can even purchase them with your monthly credit too. Who will you be making a Soleil Dress for?